The KL 2017 marks another historical milestone for Malaysia as we are hosting the 29th South East Asian Games here in Kuala Lumpur. Exciting and anticipating moments as all Malaysians shall be united in support of our sportsman and women. Sports has never failed to lifts our spirits as Malaysian. 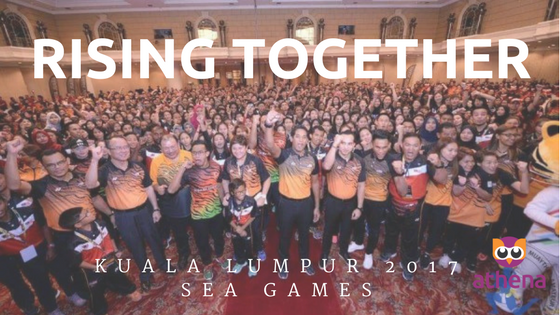 As the theme “Raising Together” represents the United Malaysian coming together regardless of our race or culture because we are one Malaysia. Complimenting each other on our diversity and accepting each other unique identity. A great value to instill in our children. Treating everyone with respects and cherish our differences. Knowing the real Malaysian story will make them appreciate their roots and will definitely make them understand and proud of their history. How coming together will rock our world. That anything is possible when we unite. This will shape the future of Malaysia. And during this historical events will the leading example be pass on to our next generation. This is the best time to show how rich are our multi-racial unity combined to shape our Malaysia. Rising together Malaysia. And with the conjunction of KL 2017, Athena will be having a special PROMO of Athena Pad. Stay tune with the details.